Stories are told of a hero who will come to Farsala’s aid when the need is greatest. But for thousands of years the prosperous land of Farsala has felt no such need, as it has enjoyed the peace that comes from being both respected and feared. Now a new enemy approaches Farsala’s borders, one that neither fears nor respects its name and legend. But the rulers of Farsala still believe they can beat any opponent. Three young people are less sure of Farsala’s invincibility. Jiaan, Soraya and Kavi see Time’s Wheel turning, with Farsala headed toward the Flames of Destruction. What they cannot see is how inextricably their lives are linked to Farsala’s fate—until it’s too late. 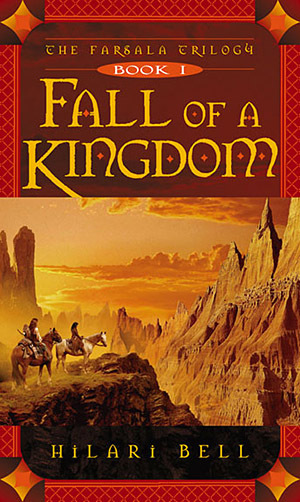 In Fall of a Kingdom, the first volume of The Farsala Trilogy, Hilari Bell introduces readers to a world of honor, danger, and magic in the spellbinding tale of self-discovery.